Why Are We Running Hills? I may be a little crazy but I love running up hills. I’m pretty sure that not everyone shares my enthusiasm when it comes to running up hills, in fact I know some of you guys LOATHE it. But there is reason behind my madness (I don’t make you do it just to torture you). 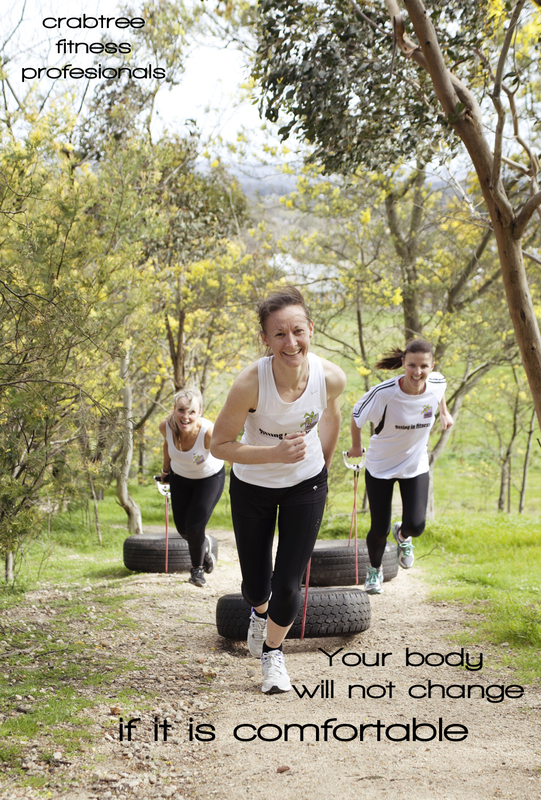 You have heard me talk about getting your body “outside the comfort zone” so that it can work hard to repair and make itself fitter and stronger while burning calories at a higher rate. Well, one of the best ways to do that is on hills. It’s not like a jog around the oval where we can slow down if it gets a bit hard. We have no choice but to work hard on the hills, we have to get our bodies up that elevation and by doing so our heart rates are going through the roof. Each time we get our heart rate up we build on our cardiovascular fitness. This is why when people first start exercising after a long break they have no stamina and get puffed quite easily. But after a few weeks of putting your body out there it increases the stamina and we can work harder and faster for longer. My Mount Clear bootcamp ran up and down Olympic Ave (steep hill) this morning and did an awesome job. We are into week 6 now and you can see that everyone has built on their fitness from when they started. If I had have done that workout in week 1 I’m sure a lot have people would have struggled and possibly not returned (I did say it’s not like biggest loser when you train with me). We need to continue to push our bodies to get them fitter and be a calorie burning, metabolic machine. The same goes for running. Leah asked me last week about wanting to improve her 6km time. To be able to run faster we need to train harder in short bursts, not just try and run faster on our long runs. Interval training has the same outcome as training on the hills, we get our heart rates up and then get a recovery on the rest period. I suggested that Leah run intervals of 500m quickly (so that she is exhausted and ready to collapse) and then do 500m recovery, this could be walking or a slow jog. By doing this she is getting her heart rate up much higher than what it would be if she was just running her 6km. The same principal applies in that each time she does this her body will repair and get fitter so that she can run at a faster pace and be more comfortable than she would have been before. Interval training is the cornerstone to building fitness and pace. Our bodies do plateau so its up to us to keep shocking them and do something different on a regular basis. That’s why I like to do different workouts to keep your bodies guessing what is around the next corner or up THE NEXT HILL!! Love the blog & workout today Jac!! I love hills too and am looking forward to the next 5 weeks. Thanks for all the support! Thanks Jane. I’m loving that you share my passion for hills!! Conquered Mt Innes again! Thanks Jac..It was great – and thnaks for ferrying my kids there too! All part of the personal training job. Although I don’t remember the lesson on “ferrrying kids” in my course! !